A "Cheesesteak Interlude" premiered at the Kimmel Center and Carnegie Hall. 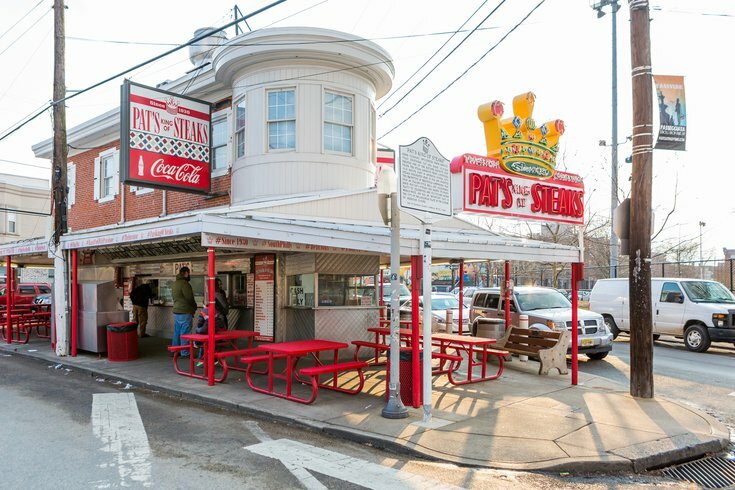 Pat's King of Steaks, 1237 E. Passyunk Ave.
Machover’s is known for infusing technology in music; in his city symphonies, he samples different recordings of the towns to create the work. "Symphony in D," for example, honors Detroit with the sound of a Ford Engine. Though Machover wanted to resist the obvious association of Philadelphia with cheesesteaks, the opportunity to record directly over a griddle at Pat’s could not be resisted. “Not only did they let me put my microphone almost on the griddle when the cheesesteaks were sizzling, the cook tried to tell me that the cheesesteaks weren’t so bad for you,” Machover told NPR. He also included sound from the Museum of the American Revolution and the heart at the Franklin Institute for the audio postcard. Machover spent months field recording and also had about 8,000 submissions from local Philadelphians to sift through, the New York Times reported. In creating the symphony, Machover chose to include texts written by poets about Philadelphia, covering everything from its innovations to its struggles to its weird parking habits. The sound of the Philadelphia Eagles winning Super Bowl LII is also featured. During editing, it was Machover’s audio from Pat’s that ended up more prominently featured than originally planned. Listen below for a preview of how the one-minute "Cheesesteak Interlude" sounded during rehearsal at the Kimmel Center, and check out why Machover decided to feature the famous sandwich so prominently.